Beautiful Incentives: Free and DEEPLY Discounted Jewelry from Shop Lately! 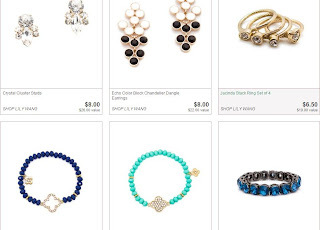 Free and DEEPLY Discounted Jewelry from Shop Lately! OK, EASY SHMEASY one. AWESOME opp! Receive $5 when someone joins, $15 when they purchase. This is for a LIMITED TIME and it has to be done from FB. Then you just need to click Sale Rack and pick out your FREE Item for $5 or less! :) Shipping is a flat rate of $2.99 and with all the credit you can rack up, you can get a lot of loot for cheap! Think Valentines Day, Men! Here is just a preview of the beauties they have at already deeply discounted prices!